KVC West Virginia, a division of KVC Health Systems, is a national leader in providing innovative, effective and compassionate care. 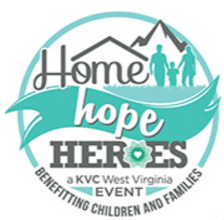 KVC West Virginia is hosting their 2nd Annual Home. Hope. Heroes. event on June 28, 2017 at the West Virginia Culture Center beginning at 5:30 p.m.
Home. Hope. Heroes is an evening of fun, food and fellowship as everyday heroes come together to improve the lives of children and families across the state of West Virginia. Learn about the Safe at Home West Virginia program and be inspired to make a difference in the life of a child. Enjoy a brief program in the theater followed by a reception featuring music, food and networking. KVC will be honoring WV State Senator, Ed Gaunch and KVC WV President, Brent Lemon will be making some brief remarks. Entertainment will be provided by WV Treble Makers, Directed by Ilse Long. Barbara Nissman, world reknown pianist, will also perform. Please consider becoming a supporter/sponsor of this event and KVC. KVC West Virginia is a private, nonprofit child welfare organization that provides a diverse array of services including foster care, adoption, in-home family preservation services, and outpatient psychiatric and behavioral healthcare. In partnership with the West Virginia Department of Health and Human Resources Bureau for Children and Families, they utilize the Safe at Home West Virginia program to maximize the benefits of home and community-based services for children in out-of-home care. They are committed to enriching and enhancing the lives of West Virginia children and families.